The proof is in. America’s campaign against militants in Iraq and Syria is a phoney war, for the benefit of TV cameras and a gullible Western public. The figures spell it out. Prior to Russian intervention last September the U.S. and its allies conducted 7,000 air strikes against militants in Syria and Iraq, beginning in September 2014. That may sound impressive but compare that with Russia’s 29.000 air strikes carried out over seven months since it intervened in September 2015. Think about that for a moment. Because the Russians carried out more than FOUR TIMES AS MANY air strikes than America and its allies did — in almost half the time. Did the U.S. Air Force and its allies think they were on a leisurely stroll or something? Little wonder then that prior to Russian intervention Islamic State (ISIS, ISIL or Daesh) had been steadily expanding its area of control, despite Western air strikes. Put that together with reports that U.S. planes were bombing empty desert with ordnance intended for ISIS, or that clearance to bomb ISIS targets was being withheld 75% of the time, and claims that Washington is actually protecting militants start to make sense. All the more so when you factor in official documents indicating that Washington had been using the militants to oust Syrian President Assad. Or at least it was, until Russia’s decisive intervention. In other words the much vaunted Western campaign in Iraq and Syria is a complete fraud. Russia’s brief campaign has exposed that and in little more than seven months turned the war against ISIS into a rout of the militants. Full credit to the Russian armed forces for what they’ve achieved and to Putin, for exposing the Western leaders for the war mongering liars they really are. If there is ever to be justice for what has happened then our so-called leaders — and their whore collaborators in the media — should swing. Ed. Russian warplanes have destroyed over 29,000 terrorist targets in Syria over 7 months of the anti-terrorist air campaign in the war-torn country, the Russian General Staff said Wednesday. 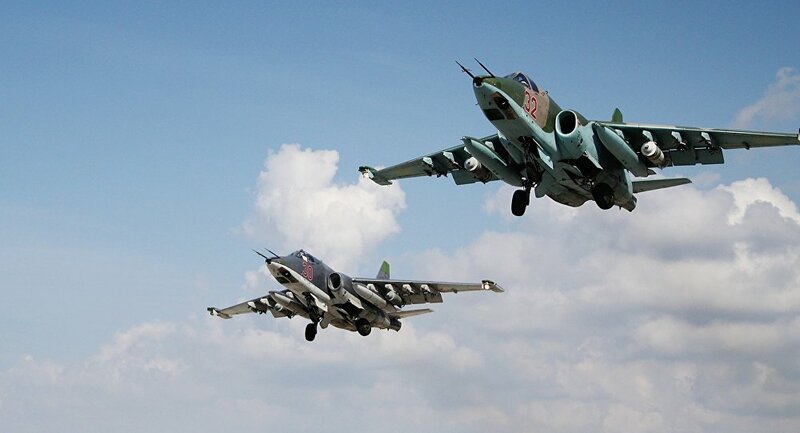 “Over almost seven months of the Russian Aerospace Forces’ military operation [in Syria], more than 9,500 sorties have conducted and some 29,000 terrorist targets have been destroyed,” Lt. Gen. Sergei Rudskoy said. The Russian Aerospace Forces have destroyed over 200 terrorist oil facilities since the start of the military operation, Sergei Rudskoi, head of the General Staff’s Main Operational Directorate, said. Rudskoy emphasized that Russia has carried out zero strikes leading to destruction of civilian facilities or civilian deaths. He said that the Syrian government forces are capable of winning the fight against terrorists with the support of the remaining part of Russian aviation after the partial withdrawal. The U.S. air campaign against ISIS: in numbers. What started as a limited operation just over a year ago has since expanded to include a host of bases and hundreds of U.S. troops. As of Sept. 22, the U.S. and its allies have launched over 7,000 airstrikes against ISIS targets in Iraq and Syria. The Obama administration likes to hype up that there are over 60 nations involved in the fight: “America will be joined by a broad coalition of partners,” the president said. But when you look at the numbers, it’s clear the U.S. is doing most of the work, especially in Syria — where American warplanes and ship-based Tomahawk cruise missiles have pounded not only ISIS, but also the Al-Qaeda-linked Khorasan Group and Nusra Front. Remember the above AOL report was written at the outset of Russian intervention in Syria. Before the full impact of its action there became clear. Now seven months later the AOL’s boast that the U.S. was “doing most of the work” against the militants sounds especially hollow. As as we now know Russia carried out more than FOUR TIMES AS MANY STRIKES in half-the-time it took the U.S. So Russia did most of the work and effectively turned the tide. NOT the U.S.